I recently dedicated some time to closing some of the 86 tabs I had open, and I finally had a chance to read an Edutopia article that I’d opened long ago. As inquiry teachers, and certainly as music teachers as well, I think it is fairly intuitive to use mistakes as opportunities to reflect and improve, rather than simply labeling them as “wrong.” There were a few ideas that I’ve taken into my classroom this week with a heightened awareness of how I react to “wrong” answers, and I feel like they have helped to keep interest and momentum going. The first was to respond with a clarifying question or a “What makes you say that? If you could ask yourself a question about that answer, what would it be?” Not only does this encourage the student to think more deeply, it also makes the student’s misconceptions more visible to me as the teacher. Another interesting idea—and one that seemed pretty far out there when I first read it—is to have a wall or a class discussion where students focus on mistakes they’ve made and how they learned from them. I am still wrapping my head around the best way to frame that, but I like the concept! The bottom line is that the more transparent we are about mistakes and how useful they can be to all of us (teachers and students), the more students will feel comfortable taking risks, trying new things, and learning from their mistakes instead of trying to hide them. 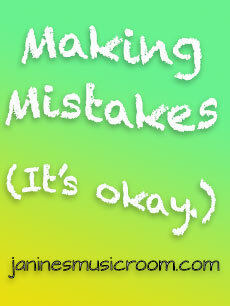 What kinds of things do you do to redirect mistakes into learning?